1 part water to one part powder. Use whatever size scoop you want. Here I used a 1/4 cup. Add water to the cup first. Dry your scoop and add the same amount of powder to the water. Gently stir in the powder, thoroughly mixing. We did not add any “Anti Foam” to this paint, so you may see some bubbles. They will settle out more the longer the paint sits. Real Milk Paint has a lot of pigment, but when going over an old finish for the first coat you will see some transparency. Give a second coat when the first coat is dry. I like to mix my paint two days ahead of time, then put it in the refrigerator. 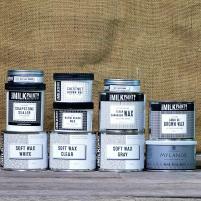 This makes Real Milk Paint very smooth and creamy. Do you add the ultra bond in with the paint? I like to mix mine using a jar, specifically, a 16 oz. Talenti Gelato container. After adding water and milk paint, stir to just blend, put the lid on and shake really well. Then let it sit for 20-30 minutes and lightly shake once more before you begin painting. For my classes, I use baby food jars, since we are only mixing a couple of tablespoons of milk paint. It works great and if there is any left over, place the lid on and store in the refrigerator.